Keeping track of thousands of fiber optic cables… This is an enormous challenge for hyperscale data centers. R&M has the answers. Hyperscale data centers offer the cloud industry a cost-effective and appropriate way to respond to demand. The market segment is currently growing by an average of 20 % per year. The scalability is based among other things on there being an abundance of available optical fibers. They must be introduced into the building and distributed inside. High count fiber cables with more than 2,000 or 4,000 multi-fiber cables are usually used to cover the connectivity requirements in the hyperscale segment. These sizes require new types of cabling solutions. It is essentially a question of achieving the maximum possible packing density. But cabling has to be easy to operate and adaptable. 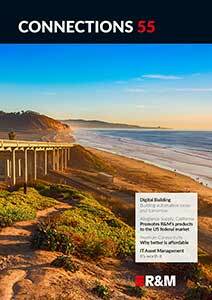 Technicians and managers in the data center must be able to see the broader picture. Finally, network monitoring should be automated because it is now virtually impossible to control the complex systems manually. 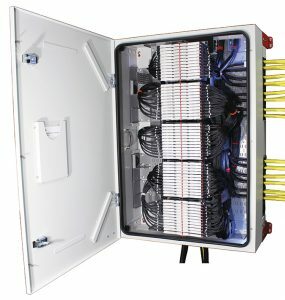 The BEF-60 splice cabinet from R&M accommodates the fiber optic cables at the entrance to the hyperscale data center and distributes them. Up to 23,040 splices fit into the 60 drawers of the cabinet. The BEF-60 splice cabinet is the starting point for scalable spine and leaf topologies. The capacity: 23,040 splices over 60 drawers. With up to 120 ports per height unit in the 19’’ rack, the R&M distributor Netscale offers maximum port density. It is the platform for fast migration beyond 10 or 40 Gigabit Ethernet. The Netscale Blade Cabling Manager (BCM) accelerates the cabling of modular switches for cloud networks. It leads cables directly from switch ports to patch panel ports. Cable management in the cabinet is thus no longer necessary. R&MinteliPhy for Netscale brings fully automatic network monitoring into the data center. Thousands of FO connections can be monitored in real time. The slim-line FO connector LC-QuickRelease (LC-QR) increases packing density by 60 % per height unit. With OM5 cables from R&M, data centers are making first forays into Wavelength Division Multiplexing (WDM) for multimode fibers.